When you look at your finances, what you really want to know is – ‘how are we doing?’ It is quite easy to drown in numbers and not see the stories the numbers are trying to tell us. After all, a number is only useful if helps you make business decisions. 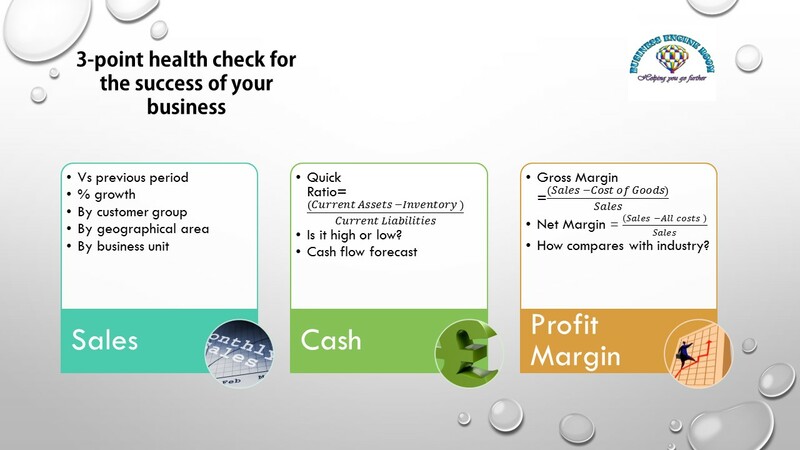 For profit-making companies, here is a 3-point checklist to assess the financial health of your business and understand the stories the numbers are telling. Not rocket science! Sales tends to be the first thing a business owner looks at. How do sales compare with the last month/quarter/year? Are we growing? More interesting analysis is around what makes sales grow (or not) – is it volume, price increases, or a combination of the two? It may be useful to break sales down into geographic areas or customer groups, to see how performance varies. It may well be that underneath an average sales performance overall, there are successes in some areas and failures in others. Once you understand what these areas are, there are some decisions to be made. Gross Margin or Contribution is your sales minus the cost of goods, or sales minus variable costs (i.e. not overheads) for service businesses. This figure will tell you how much money you make on your basic business activity and whether it is worth your while. It is useful to compare your gross margin as a percentage to the prevalent margin in your industry. If you are making 20% of sales in gross margin, while your industry peers are managing 40%, perhaps you need to examine your costs. If you have several product lines, look at the contribution of each of the product lines – are they all performing well? Do they cross-subsidise each other? Unless the product which is losing you money is a loss leader you have consciously committed to, you may want to review your product offering or product mix. Net profit margin – in simple terms, it’s your profit after all costs have been deducted; in percentage terms, it’s your net profit figure over sales. A positive profit figure is, obviously, desirable, as it indicates that you have covered all your costs and made some money. Taking a step further, is your net profit margin reflective of your industry? Does it represent a reasonable return on investment? (to find out the latter, take net profit and divide it by your capital employed, i.e. equity plus long-term debt) If your gross margin is ok but your net profit margin is too low, it is time to examine your overheads and/or create a strategy to grow your sales. Cash is crucial for small and medium-sized businesses. Even if the business is profitable, lack of cash can quickly lead to problems. Quick ratio – this ratio is your current assets (cash or what can easily be converted into cash, but NOT inventory and NOT fixed assets) over your current liabilities (current means due within a year). This ratio helps you assess whether you have enough ‘liquid’ assets to cover your debts. While the exact figure varies by industry, 2 to 2.5 is a good rule of thumb for most businesses. If your quick ratio is low, beware of potential cash flow problems. If it is too high, consider investing excess cash into longer-term investments to maximise your income. Cash flow forecast – while this isn’t exactly a ‘figure’, forecasting your cash flow is crucial for businesses which are growing, or businesses which are in a downturn. It is a planning tool, which can prompt a number of actions to remedy the cash position. You may find that you need to chase your debtors more actively or negotiate with your suppliers for longer periods of payments. You may also find that you need short-term finance to support your rapid growth.